Stop number 3 on my Central America reunion tour has been Guatemala, which was my favourite country the first time I visited. The truth is that when people used to ask me to list my favourite destinations in the world I would always say Guatemala, but I think I started to forget why. After spending a week back here the reasons have all come racing back to me. I love the history of this country, it is so deep that it almost seems too incredible to have really happened. I love the people who are so friendly, caring, helpful and always willing to share a smile and a laugh. And of course I love the scenery. This photo of Lake Atitlan, taken from the banks of Panajachel, exemplifies the power of Guatemala’s natural setting. Three volcanoes pierce through the waters of historical Lago Atitlan and form an impressive backdrop. As far as country destinations are concerned Guatemala has as much to offer as any country in the region. I hope you enjoy the photo, I’ll be coming back with an article about Panajachel and Lake Atitlan when I have a little more free time. Again, when shooting any sort of landscapes you should be shooting within “the golden hours” of around sunrise and sunset. I have gotten to the point where I don’t even look at a landscape during midday. I can’t tell you how many times midday I’ve taken a photo of a landscape that made my jaw drop, but then the photo just looked dull. 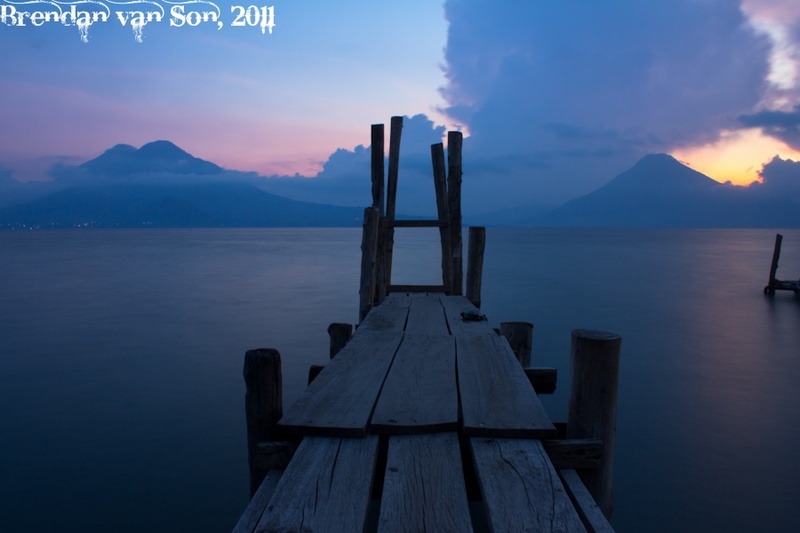 This photo of Lake Atitlan in Guatemala was shot about 30 minutes after sunset which is usually my favourite light. I shot it on a tripod with a long exposure to smooth the water, giving the image a sense of peace and calm. Quite honestly, the difference between professional looking travel photos and snapshots is basically the use of a tripod. Those who are willing to pack their tripods around the world, or at lease seek out stabilizing devices, will have every advantage in the world. This shot would not have been possible without my tripod. For the photographers with an insatiable curiosity, this photo of Lake Atitlan was taken on a Canon 60d with a 18-55mm f/3.5-5.6 lens at 18mm, with an exposure of 25seconds at f/16 (Iso 100). Out of interest what tripod do you use? I am looking for an ultra lightweight one to travel with for those long exposure opportunities. Honestly, I use a super super cheap tripod that would make most pro photographers shake their heads in shame. Look at the manfrotto tripods as I have found that they are sturdy and lightweight and good value. Just make sure that the amount of weight the tripod says it can support is double what your camera and lenses weight… they always seem to lie about their weight capacity. Go to BHphotovideo.com and you can get a number of reviews on tripods and all the specs. Thanks for your advice Brendan. I am currently toting a Lumix LX5 so the weight capacity issue is not an issue. Yeah, honestly if weight isn’t an issue just pick up a cheap lightweight tripod sturdy enough to not be blown away by a small gust of wind. Great photo as always! My mom used to live in Guatemala and had a lake house on Atitlán – I’ve seen some amazing pictures that she and my dad took, and I’d love to see it for myself. Brendan, I am loving your posts on Guatemala! I’m planning a month-long trip there in January. People keep asking me, “Why Guatemala?” They obviously have not done their research! Great pictures! Then Erin, just trying to do it justice. You will love it. It’s my third time here and I know I’ll be back again. Absolutely beautiful. And I love that you came back to Guatemala and are loving it as much as you did before. I had a student last year who has a small house on that lake and invited me to stay there anytime. I should take him up on it! Now I’m going to be thinking of Guate all morning 😉 Thanks man! Thanks Jordan, I’m glad you like it!